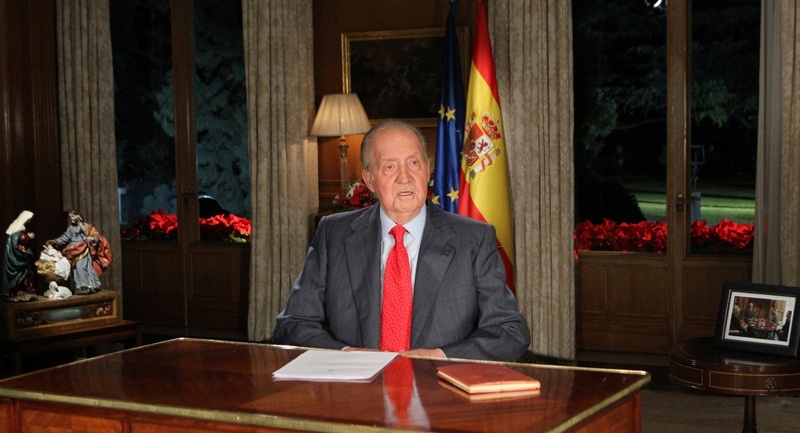 King Juan Carlos called for unity during his customary Christmas message amid efforts by Catalan separatists to increase the region’s autonomy or become independent. The King said the Constitution of 1978 has provided the country with its most stable period of liberty, something citizens must recognize. At the same time, he appeared to empathize with those who believe more changes are necessary. “I am convinced that all these questions can be resolved with realism, effort, the rule of law and the generosity of political and social forces,” said the King. Don Juan Carlos also took time to recognize the ongoing economic crisis, note those who have left to work abroad, and the extended families who are pooling their resources to make ends meet. 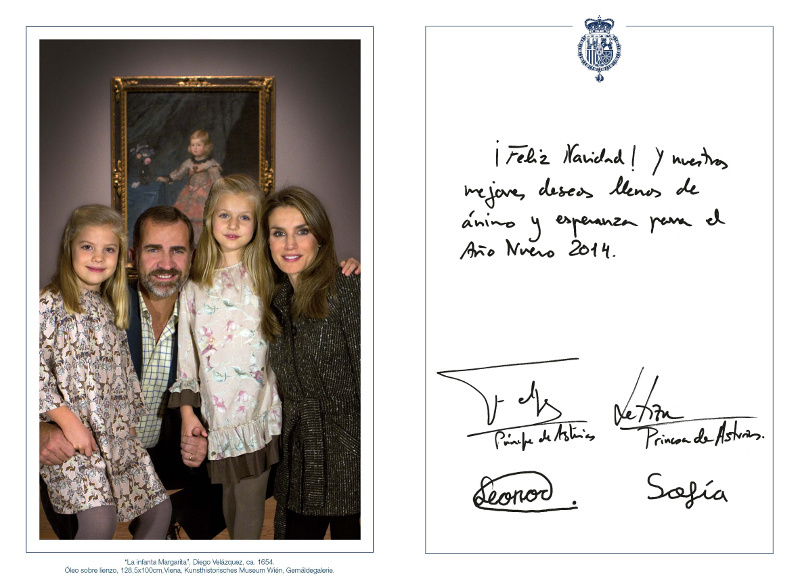 The Spanish Royal Household released the Christmas cards from King Juan Carlos and Queen Sofia, and Prince Felipe and Princess Letizia. 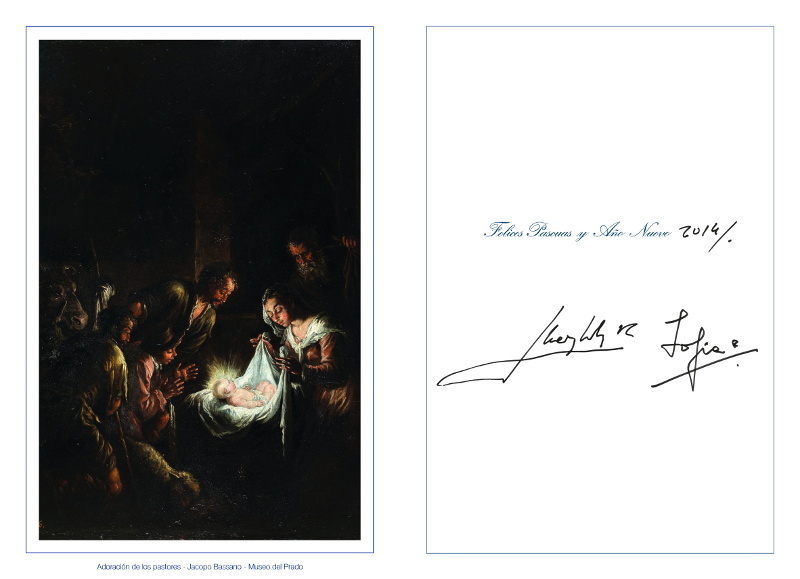 The King and Queen’s card features an image of Bassano’s “Adoration of the Pastors,” part of the Royal Collection at El Prado National Museum in Madrid. Prince Felipe and Princess Letizia of Asturias sent out a family picture. In the backdrop is a 1600’s portrait of Infanta Margarita. In recent weeks, the Royal Household also released a website for children to learn more about the Royal Family. Infanta Elena, the King’s eldest daughter, expressed concern this month by people’s skepticism with public institutions, including the Spanish Crown. “I am disquieted by the distance people are feeling with institutions,” Her Royal Highness told the Spanish EFE news agency during a rare interview this month to mark her 50th birthday. Infanta Elena is known for her stylish and very Spanish dress style. 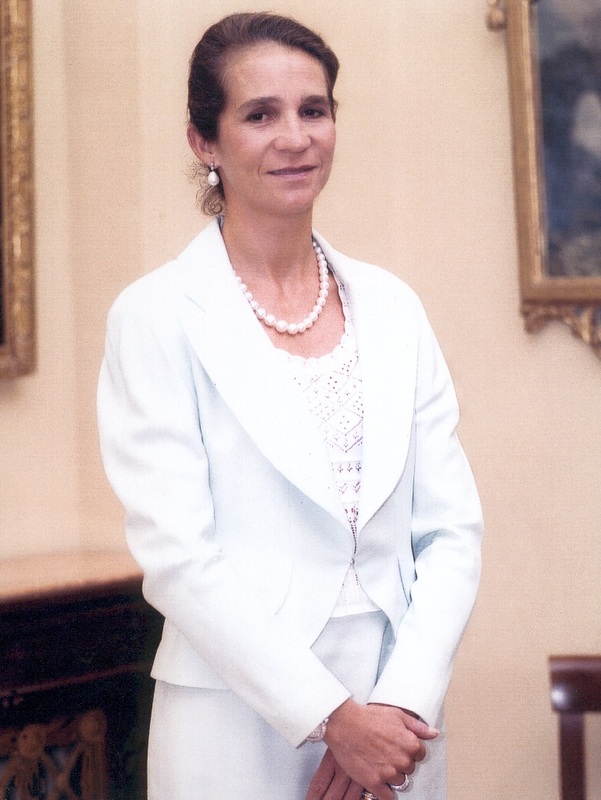 Infanta Elena, who is divorced, said she is always willing to represent the King, her father, and Spain at home and abroad. Infanta Elena said her father taught his children a culture of effort. Her mother, the Queen, taught them tolerance, respect and concern. 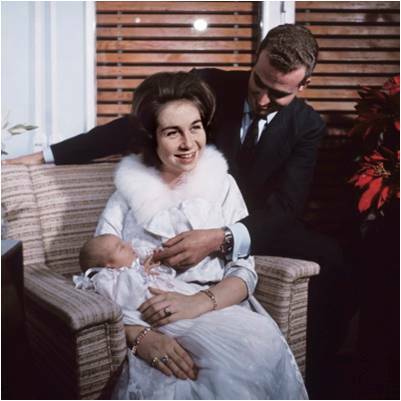 Queen Sofia holding Infanta Elena in 1963. The Spanish princess, who manages cultural and social projects for the foundation associated with insurance company MAPFRE SA, would not talk about her brother-in-law’s corruption investigation or talk of her father’s abdication. She said her own children are more of their generation, focusing on homework and getting ahead. Click here to read the interview (in Spanish). 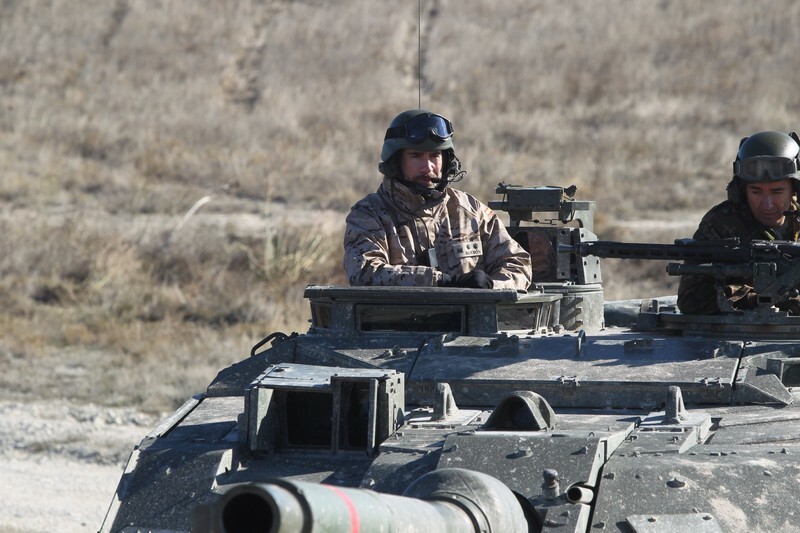 Prince Felipe helped lead the Spanish delegation to former South African President Nelson Mandela’s fineral this week. 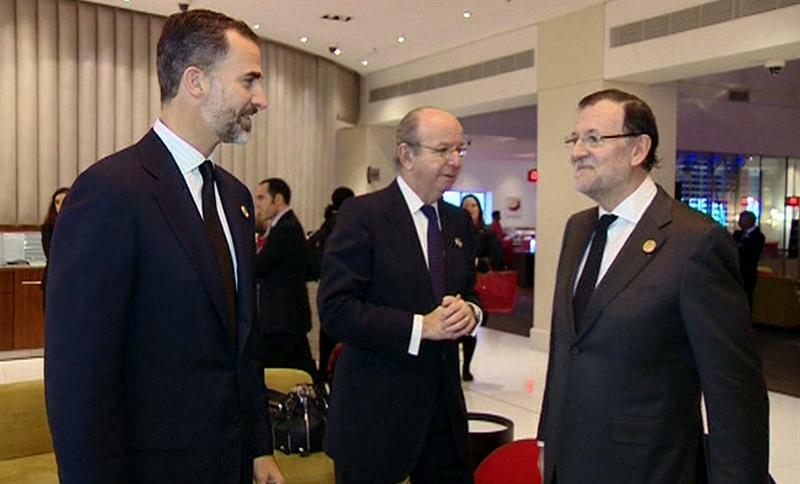 Prince Felipe with Royal Household Chief Rafael Spottorn and Prime Minister Mariano Rajoy. King Juan Carlos released an open letter expressing his condolences shortly after Mandela’s death. The King and Queen, plus Prince Felipe and Princess Letizia also sent telegrams to the South African government and Mandela’s family. King Juan Carlos has always had a healthy sense of humor. Now, according to recent news reports, his new surgeon, Dr. Cabanela, revealed that His Majesty pretended to fall as a practical joke to health aides. Cabanela also said the King tried to reach him at home but spoke to his wife instead. Cabanela said his wife was startled by the telephonic encounter. 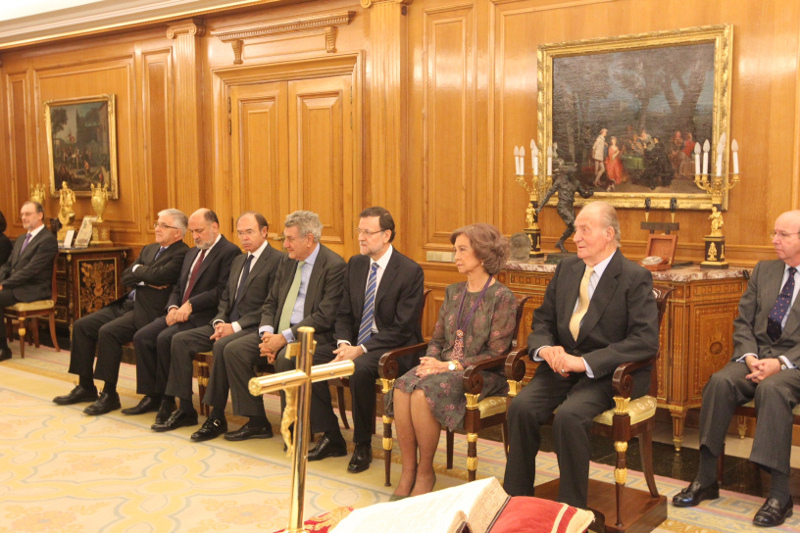 King Juan Carlos swearing in new judicial branch aides at Zarzuela Palace this week. The King recently had his second scheduled operation and is now in recovery. 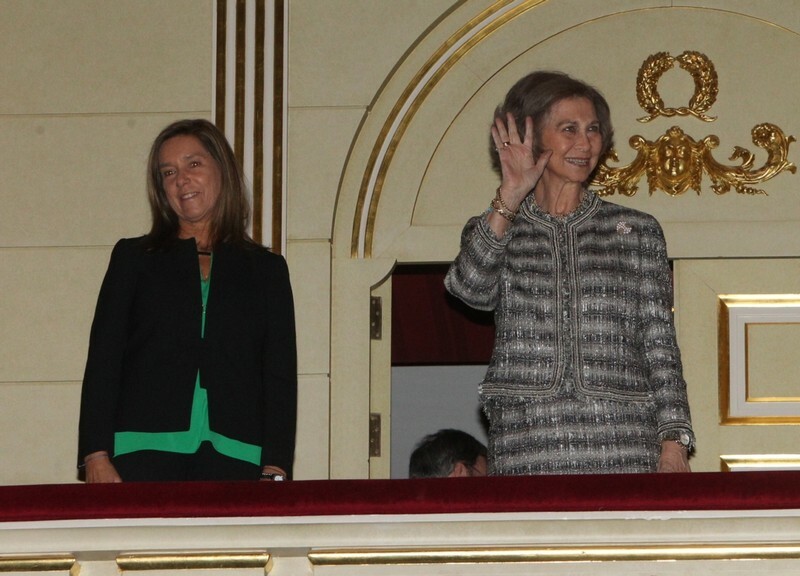 Meanwhile, Queen Sofia yesterday attended a Christmas concert at the Teatro Real in Madrid. The Queen in the Royal Box. Media reports indicate the Queen is now in Geneva for the birthday of one of Infanta Cristina’s children.